President Xi Jinping has called for mobilization at the national level and joint participation from the whole of society to move forward with large-scale campaigns to make the homeland greener. 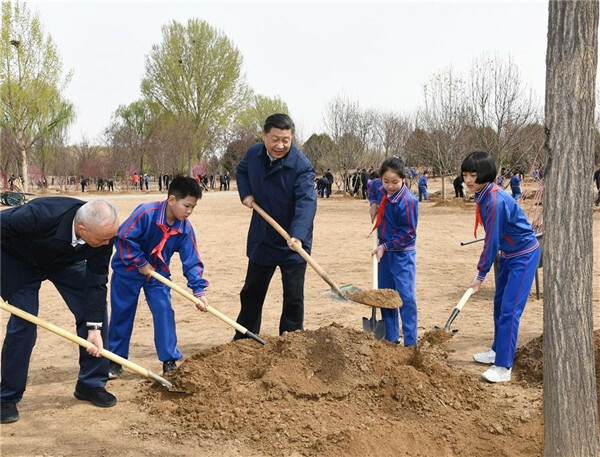 Xi, also general secretary of the Communist Party of China Central Committee, made the remark as he took part in a voluntary tree planting event in Beijing on Monday. 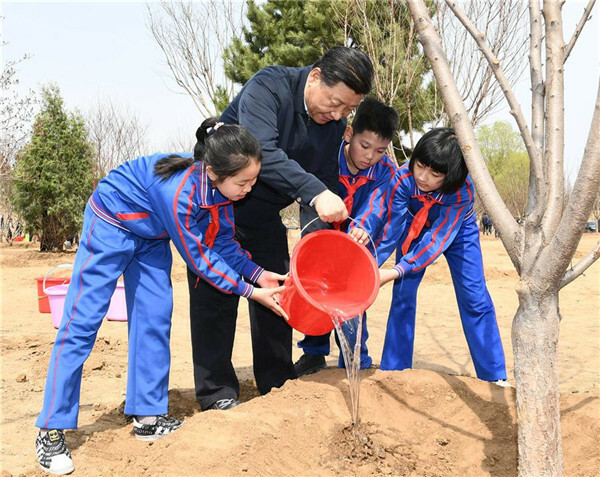 Working alongside students, Xi shoveled soil and emptied water buckets before planting seven trees in a forest park in the capital's Tongzhou district. He underscored the importance of giving play to China's honored tradition of loving, planting and protecting trees to ensure that national forestation programs yield concrete results continuously. He noted that this year marks the 40th anniversary of China's creation of the tree planting festival on March 12 each year. Over the past 40 years, China's forest coverage and its net volume of timber have doubled, he said, adding that China has made the largest contribution to the world's increase in the area of vegetation in recent times. However, Xi said the country still has a lot to do to make up for the environmental arrears of the past, and its lack of forest cover and vulnerable ecology remain problems requiring substantial efforts to conquer. He called on officials at different levels to lead the public in making unwavering efforts to continue with tree planting programs. It is also important to act on the understanding that clear waters and lush mountains are invaluable assets, promote the high-quality development of forestation programs and continue to promote the development of forested cities and rural areas, he said. He also called for greater efforts to improve the living environment, develop the green economy and step up the management and protection of forests. Environmental protection has long been a priority for Xi, who has called on several occasions for efforts to protect the natural environment "the way we protect our eyes", and cherish it "as we cherish our own lives". China has set a goal of making itself a developed country in the forest sector by the middle of this century in a guideline on promoting the greening of the homeland issued in November. The country also aims to increase its percentage of forest cover from 21.7 percent in 2018 to about 23 percent in 2020, and 26 percent in 2035.